Northridge House Education and Research Centre are hosting our 7th annual Conference in the Radisson Blu Hotel on April 11th. The conference theme “Enhancing Quality of life in Unrestricted Healthcare Environments” was chosen to reflect current legislation and upcoming HIQA thematic inspections. The Assisted Decision making (Capacity) Act 2015 was signed into law in December 2015 and supports decision making and maximises a person’s capacity to make decisions. 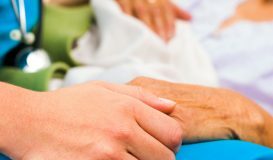 It has significant implications for health and social care providers in the provision of person-centred care that is based on respecting the individual rights of the person. A key feature of the act is that it provides a framework for individuals to make legally binding agreements to be supported and assisted to make decisions about their welfare, property and affairs. According to the Act, a person’s capacity is to be assessed on the basis of the individual’s ability to understand, at the time that a decision is to be made, the nature and consequences of the decision to be made by him or her, in the context of the available choices at that time. The act applies to all health and social care contexts and ensures that a person has autonomy to make their own decisions in relation to their treatment choices. The act places an obligation on healthcare providers to support the person to make their own decisions where possible and when not possible to provide supports to enable that person make their decision. All healthcare providers should be familiar with the act and consider its implications. According to HIQA (2016) a restrictive practice is one that limits an individual’s movement, activity or function, interferes with their ability to acquire positive reinforcement, results in loss of objects or activities and limits freedom of choice. Restrictive practices are potentially harmful and have serious consequences for older adults and their families. Central to reducing the use of restrictive practices in healthcare settings is the need to ensure that care is provided in both a person-centred and value based way. This will ensure that the rights of the person are promoted and quality of life is enhanced. Northridge House together with St. Luke’s Home are hosting a conference and masterclasses that will closely address these two important areas of practice along with addressing relationships and their impact on health outcomes. The centre is pleased to have a wide and interesting line up of speakers who have personal and professional experience in these areas. Prof. Amanda Phelan will give the Key note address and a masterclass on restrictive practice and understanding how we promote rights. A second masterclass facilitated by Dr Maeve Hurley will address the link between quality of life, relationships and health outcomes. 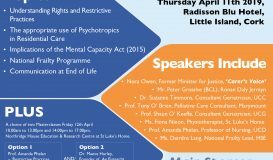 Mr. Peter Groarke and Prof. Shaun O’ Keeffe will speak about the implications of the forthcoming Capacity legislation from differing perspectives, while Dr. Suzanne Timmons, Ms. Deirdre Lang and Ms. Fiona Ryan will give unique insights into the areas of psychotropic medication use, frailty and the physios approach to restraint reduction. 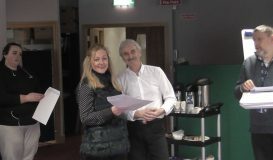 Mrs. Nora Owen will profile the voice of the carer, offering us an insight into her journey caring for her husband Brian after his diagnosis with dementia. It is hoped that this conference and masterclasses will enhance understanding in these important areas and offer practitioners a forum that promotes learning and fosters discussion.